i've just booked a couple of flights with cebu pacific online, and on its page is an update of its on-time performance. the percentage for january is dismal: 68.7% (it was worse in december: 62.7% -- thankfully it did not affect my singapore flight). there used to be a time when cebupac (or which i sometimes refer to as 5J) crowed about its 98% on-time flights. i was part of the 32.3% of flights that got delayed. when i went to cebu over 2 weeks ago, they made us wait more than 2 hours before we could fly. and after the announcement of our delayed flight, a very calm and low woman's voice announced more delayed flights: to iloilo, bacolod, davao, zamboanga... imagine if this happened at the old domestic airport... i shudder at the thought. although i have to say they used to give free meals for delayed flights there. this time around, they just made us wait. so with all the free time i had, i figured: why not explore NAIA T3's domestic wing? and so i did, and here's a service to anyone flying 5J or air philippines (2P) or PAL express (PR -- yes, they're here in T3, and not at the centennial terminal) anytime soon: a low-down on the facilities at the not-so-newly-minted, but recently-opened, terminal 3.
departure hall when you're dropped off at the departure ramp of the terminal, taxis should take the left lane while private cars take the right. there are pushcarts available there. currently, only 3 of the 5 gates are open, and each one already has a baggage x-ray machine and a metal detector. a pat-down will also be done, although there is as yet no need to remove footwear. but be sure to put in keys and cellphones along with your bags as they pass through the x-ray machine. a tip: they don't check for tickets here yet, so well-wishers can actually go inside the departure hall, unlike in the domestic terminal, T1, and T2. fortunately, there are seats on the right side of the terminal for those who are seeing off friends and family. tickets will only be inspected once you attempt to enter the area with the check-in counters. 5J has an area designated for international flights, and 3 rows of counters for domestic flights. airphil and PAL express also have their own rows of counters. zestair (6K) and seair (DG) still operate from the old domestic terminal. the capacity of T3 is huge: it can accommodate a passenger volume of 13 million passengers per year. but with the delay in the arbitration in singapore, international carriers are hesitant to make the move, and currently several check-in counters are not utilized. based on my count, there are 14 counters per row, and there are a total of 12 rows. some of the counters are being used by the DOT for payment of travel tax, and others by the DOLE (for OFWs), and also by the DENR. over 50 check-in counters are still idle. the shopping mall of T3 has yet to open, and there doesn't seem to be any construction on-going. but for hungry well-wishers and passengers who have some time to spend before they proceed to the boarding areas, the departure hall's second level has a number of food concessionaires to silence grieving stomachs. there's mister donut, jollibee, and kopi roti. after you've checked in, you can now proceed to the boarding area. first, pay the dometic terminal fee of P200. it's P700 for international flights, which i find utterly stupid because the terminal fee you're paying is supposed to be commensurate to the cost of using the terminal, and it's the same terminal! anyway, after that, you pass the immigration counters (T3 was designed to be an international terminal), which are used to collect the tickets for the terminal fee, and then proceed to have the final x-ray. this time, you need to take off your shoes. and to be fair, airport personnel will require you to remove your footwear, even if you're wearing thongs. by the way, they're also rather ruthless with hand-carried items. they will confiscate anything from empty water bottles, unopened bottles of wine and spirits, all sorts of liquid or gel exceeding 100ml each, masking tape, toy guns, umbrellas, balloons, etc. i asked someone what they do with the confiscated items, and they said they would be destroyed. yeah right! chaikofi - serves coffee (ranging from P75 for espresso solo to P139 for kofi spikes), hot tea (P79 and P95), fruteas (13 flavors ranging from P75 for lemon mint green tea to P95 for apple & cinnamon tea infusions), salads (P175 for a crab & mango salad and caesar salad), pasta (P175 for carbonara, pomodoro, pesto, fruitti de mare), rice meals (P165 for beef chai rice and chaidobo, P195 for dutch chicken, and P155 for zwart sauce pork chop and sate babe/ayam), sandwiches (P185 for chaikofi melt and pastrami, P155 for verdure). they also have a whole chicken pt roast at P439 and desserts. dèlifrance - has a more limited menu compared to its branches outside the terminal. serves hot beverages (P75 for a petit cup of brewed coffee, P90 for a double espresso, and P80 for hot tea or hot chocolate), classic sandwiches (P125 for an egg mayo, P175 for chichen mayo and tuna onion, and P200 for crabstick celery), clubhouse (P230 for the premiere and P240 for the seafood deluxe), pasta (P160 for the baked rigatoni and P175 for a beef lasagna), and pizza baguette (P125 for hawaiian and P130 for the vegetarian and four cheese). you'll find their stall immediately after you're done with the final check at the aisle. go nuts, donuts - a donut retails for P35 a piece. a box of 12 costs P330. also serves beverages. located conveniently behind dèlifrance. cinnabon - a sinful serving of dulce de leche retails at P105, while there are packages ranging from P500 to P1000. hot out of the oven buns range from P110 (for the tuna croissant, minichocopecanbon, ham and cheese croissant), P140 (for the classic) and P165 (for the pecanbon). a cooled and ready-to-go cinnapack ranges from P120 (for 8 stix), P385 (for 4 pieces of the classic bun), to P625 (for 9 pieces of the triple combo). they also serve coffee (P80 for a 12oz brewed and P110 for a café mocha), tea (P80 for black and lemon tea), and specialty drinks (P160 each for a 12oz chillattas or iced mocha). it's found along with a row of food concessionaires on your left side coming from the last pat-down. hen lin - serves dimsum (hen lin siopao at P41, special siopao P50, hong kong style siopao P50, and siomai at P46). a bit further off, it's right along gates 118 and 120.
stop & fly café - situated at the boarding area's smoking lounge, it serves coffee and sells a variety of imported and local snacks (chips ahoy, oreo, mallows, etc.) and instant noodles (bowl noodles soup, lucky me, etc.). found across gate 119.
art's cream gallery - serves hot coffee (P50 for brewed coffee and P95 for a 12oz café mocha), cold coffee (from P85 for an iced latte to P100 for a caramel chill), gelato (P75 for a giant belgian cone, P100 for a cup, P170 for a waffle cone, P180 for a split second, P200 for gelato on plate, and P160 for a sundae of your choice), and affogato (a coffee-based beverage or dessert at P120 for each of the 8 flavors). they also have pan de sal spreads, hot tea, and ensaymada. located just before hen lin and stop and fly. mrs. field's cookies - serves cookies, but was still closed when i dropped by. currently at the runway level gates, they're about to open a bigger area right beside gate 116.
de original jamaican pattie shop - each freshly baked pattie (original beef, beef pinatubo, cheezy beef, beefy mushroom, beef express, special chicken stew) costs between P60 and P70. it's along the same row as cinnabon, in the terminal's unfinished area, with their aluminum foil-wrapped aircon vents and bare concrete walls. german sausages - beside the jamaican pattie shop, it's easy to miss. but it serves a wienerli for P50, and special hotdogs for P80. a beef hotdog is P70. nescafé booth - found at the runway-level gates (131-134), it of course serves coffee. chinese food - unfortunately, i didn't catch the name of this one (didn't ring a bell), but they serve noodles (beef, chicken and wanton mami at P140), dimsum (pork, shark's fin, spare ribs, and siopao ranging from P60 to P90), rice toppings (white chicken, asado and spare ribs with taosi at P160), among others (congee at P140). also serves beverages. national bookstore - everyone's favorite bookstore carries magazines and books, with slightly jacked-up prices. it's just between cinnabon and the future mrs. field's. island souvenirs - the brand's flagship boutique where you can buy souvenir shirts from all over: boracay, cebu, palawan, bohol, subic, and now, even camsur. no need to be there to get the shirt. through the years, i've collected many of their shirts, until they downsized in 2007 and maintained shop in cebu and boracay. now they're back. white shirts cost anywhere between P120 to P299. colored shirts go up to P350. they also carry crocs, golla, ipanema, electronic accessories, laptop bags, and strangely, a few toilet necessities, like shampoo and soap. located just across of cinnabon and go nuts donuts. the strange thing i've noticed about the airport is that the arrival hallways appear like dead-end areas of a mall. once you've stepped out of the airbridge, you're accosted by a narrow alley with locked doors. the design may have been lacking here, and they could have made it a bit more pleasing. of course, the boarding gates and arrival gates share the same hall, but the design could have been more aesthetic. 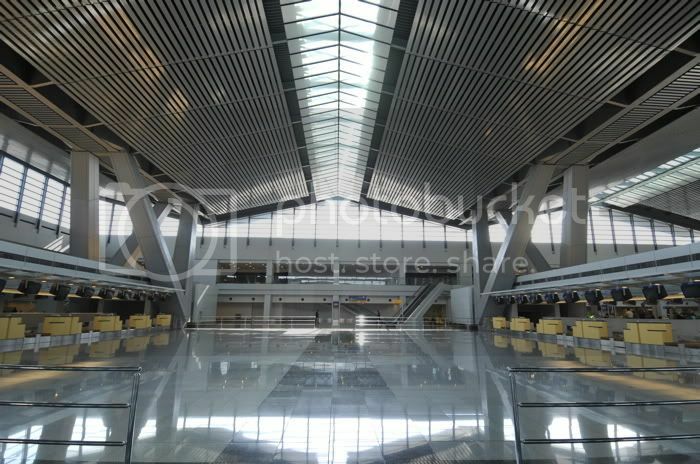 nevertheless, this is just a short hall, and pretty soon, you walk into a long, empty hall with a low ceiling (it's the space detween the boarding area and the runway-level gates and the arrival hall with the baggage carousels). it's a long walk, actually, but it has the longest walkalator in the terminal (there are 2 in the domestic wing, and one here). finally, you walk past unmanned immigration counters, and go down to the baggage claim area. there are i think 3 large baggage carousels. the international wing is separated by a blue tarp, and after you've picked up your luggage, you walk out onto the waiting hall, which has a high ceiling. there are ATM machines in the area, and the departure hall is easily accessible via adjoining escalators. so if the queue up there is too long, it's actually possible to enter through the departure area. i'm just assuming this of course. you walk out of the arrival hall, and can conveniently proceed to the yellow metered airport taxis (flag down is P70, and every 300 meters is P4). a trip to makati cost me no more than P270. i prefer this over the other airport taxi service with a fixed cost, where makati is P440. but when the traffic is bad, the latter might end up being cheaper. since december, i've used T3 a total of 6 times (coming and going), and it's massive and pretty impressive. like i just said, it's still pretty much under-utilized, and there are these ugly stickers proclaiming ownership of every single wall or chair scattered all over the place. the toilets are all functioning well (i didn't check if they had toilet paper though), and it has a sombre, post-modern feel to it. i appreciate that the triangular roofs may be interpreted as breathing a bit of filipino design, although it's less industrial looking than some airports i've been to (such as the ceiling of subharnavumi which resembles a construction site) and also, a lot less impersonal. i do hope that by the end of 2009 all international carriers would have already moved to T3, so first-time international visitors can at least have a lasting good impression of the philippines: that it's clean, efficient, orderly... not that T1 is so bad. the design for me is still a masterpiece (no less than national artist locsin laid down the plans), it's just overcapacity. so here's looking to making this entry obsolete in the near future, in the sense that T3 would have been completed, the shopping mall opened, and the concessionaires occupying less unfinished spaces. Thanks for the write up, very comprehensive. I will be using Terminal 3 with 5J flight next month. You did not mention about an airport lounge, so I'm guessing it's non-existent at this stage. I stayed at Miascor Lounge with my Diners Card member privilegelast year. Now I can't seem to find this lounge, and seems it's now CLub Manila serving Diners CLub holders. (Even Diners CLub website does not seem to have an update). I will be disappointed to not be able to use a lounge in a supposedly new international terminal. If none, I guess a Cinnabon and coffee will have to do.